But what about the historical background to Yorihira´s note? In the fourth year of Eiroku (1561), Uesugi Kenshin and Takeda Shingen faced the fourth and next to last time at the Battle of Kawanakajima (川中島). In this battle, Shingen´s younger brother Takeda Nobushige (武田信繁, 1525-1561) lost his life. “Tenkyū” (典厩, head groom) is the Chinese equivalent to Nobushige´s honorary title (左馬助, head groom to the left). So far so consistent but what differs are the records about Nobushige´s death. The war chronicle to the five Battles of Kawanakajima (Kawanakajima Gokado Kassen Ki, 河中島五箇度合 戦記) which was published in the tenth year of Keichō (慶長, 1605) says that Kenshin had pushed away Nobushige towards the riverbank of the Chikumagawa (千曲川), attacking him with a sword of Nagamitsu (長光). Nobushige was not able parry and Kenshin severed his left leg at the thigh, whereupon he felt from his horse and broke his neck. The chronicle Hokuetsu Gundan (北越軍談) written in Genroku eleven (元禄, 1698) by Mashima Akitake (槙島昭武) on the other hand notes that Kenshin attacked from his horse an unmounted Nobushige whose helmet was split whereas the sword got its nickname “Tenkyū Splitter.” By the way, the Hokuetsu Gundan is the only historical source which draws a cnnection between Nobushige´s death and the name Tenkyūwari. The works Uesugi Kenshin Mōshi Jō (上杉謙信申状, “Speeches of Uesugi Kenshin”), Ansai- Zuihitsu (安斎随筆),*4 and Bu´in Sōwa (武隠叢話)*5 say that Kenshin´s retainer Murakami Yoshikiyo (村上義清, 1501-1573) was the one who killed Takeda Nobushige. Allow me now to jump to the records of the Satake family: Tomura Yoshikuni (戸村義国, 1591-1670), a retainer of Satake Yoshinobu, drew up a report on the provenance of the Tenkyūwari-Kunimune called Tenkyūwari Go Yuisho (典厩割御由緒). This report dates earlier than the earliest references of the Uesugi family to this subject. Interestingly, it is written again that Kenshin faces the Takeda at the fourth Battle of Kawanakajima, but that it was not Kenshin himself who killed Nobushige but that he destroyed his army, and that the sword he wore at that time was a blade by Bizen Saburō Kunimune. And further, the nickname of this sword “Tenkyū Destroyer” originating from this victory must not to be taken in literal sense. *6 This entry does not preclude that Murakami Yoshikiyo had killed Takeda Nobushige. The cause for many misunderstandings or rather for confusion about the Tenkyūwari-Kunimune is mainly Matsudaira Yorihisa´s article from the Meiji period, because there were no fightings between Kenshin and Hōjō Ujiyasu in the seventh year of Eiroku. And when the latter went into battle against Satomi Yoshihiro (里見義弘, 1530-1578) at Konōdai (国府台) in Shimotsuke province in that year, Satake Yoshishige was not participating. That means he must had received the blade of Kunimune at another point in time. But we can also explain the entry about the Nagamitsu blade because chronicles on the Battles of Kawanakajima prove that Kenshin had changed his sword several times. 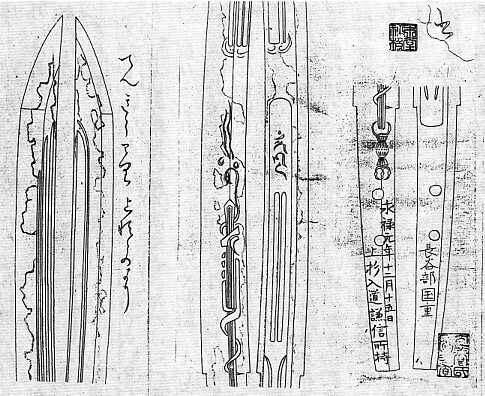 Thus he wore in a chronological order a 3 shaku (~ 90.9 cm) measuring blade of Naminohira Yukiyasu, a 2 shaku 7 sun (~ 81.8 cm) long blade of the Yamato smith Kaneyuki (包行), and the Nagamitsu, which had a nagasa of 2 shaku 5 sun (~ 75.5 cm), according to the tradition. To sum up: Uesugi Kenshin wore at the fourth Battle of Kawanaka-jima among others a blade of Bizen Saburō Kunimune, namely at the time when he destroyed the troops of Takeda Shingen´s younger brother Tenkyū Nobushige. One of the chroniclers to the Kawanakajima Gokado Kassen Ki mixed that up with a blade by Nagamitsu and took the “destruction” of Nobushige literal and attributed it to Kenshin instead of Murakami Yoshikiyo. The Hokuetsu Gundan which was published more then ninety years later played some Chinese-whisper and modified this description to the story that Kenshin splittet Nobushige´s helmet with the blade and that it got its nickname from that incident. However, it is unknown when the blade went from Kenshin to Satake Yoshishige. The length of the blade is not given. It shows magnificent carvings in the form of a broad groove with a so-called ukibori (浮き彫り) relief which is flat with the blade, two additional, parallel grooves called gomabashi (護摩箸) and a Sanskrit character (bonji, 梵字). On the backside we see carvings of a stylized dragon winding around a sword (kenmaki-ryū, 剣巻き龍). The blade itself is on one side in shinogi-zukuri and on the other side in kiriba-zukuri. “Problematic” is the signature because Uesugi Kenshin adopted the priest name Kenshin only in the twelfth month of the first year of Genki (元亀, 1570). *7 That means the signature mentioning the first year of Genroku is obviously a forgery. Yoshishige´s son Yoshinobu, Date Masamune, and Uesugi Kagekatsu once participated in a tea ceremony held by the Tokugawa-shōgun Hidetada on the 14th day of the tenth month Genna seven (元和, 1621) in Edo. It was talked about this and that before and after the ceremony but Kagekatsu and Yoshinobu got into an argument about which family own the Tenkyūwari-Kunimune. The last battle, the Siege of Ōsaka, took place not long ago but nobody knew that this – except the Shimabara Rebellion*8 – should be the last bigger action for two-hundred years. That means the ownership of a certain sword could stand at that time for the legitimacy of a succession, the proof for the existence of an alliance or family allegiance, and so none of the two was able to wave aside this dispute so easily. But could it be that just Hon´ami Kōetsu mixed up the blade, calling a Hasebe Kunishige with a fake signature of provenance „Tenkyūwari“, with the result that Kagekatsu – owning this sword – thought later that must be THE Tenkyūwari? Incidentally, in the official family register of the bakufu (Kansei Chōshū Shokafu, 寛政重修諸家譜) which was already introduced in chapter 16, we find at the later part of the genealogy of the Satake family an entry which might allude to the dispute about the Tenkyūwari-Kunimune. The entry in question reads: “Cause for the grudge against the family of Kagekatsu is a false claim which is clearly an offence.” Questions upon questions. However, the Hasebe Kunishige was later until Word War II in the possession of the viscount family Ōseki (大関), the former lords of the Kurobane fief (黒羽藩) in Shimotsuke province. Thereafter the tracks of the sword are lost. But there is another anecdote known about the Tenkyūwari-Kunimune. Satake Yoshishige was made lord of Hitachi´s Ōta Castle (太田城) ten years before the Battle of Sekigahara. On a humid summer evening he decided to sleep in a watchtower of the castle which was close to a pond and therefore a little cooler. He set up his “night lodging” in the second floor whereas his servants slept one story below. Around the witching hour they were awakened by a loud scream and rushed to the second floor to check that everything is in order. They asked: “Mylord, what was that?,” but Yoshishige was still sleeping and had to be waken up. “We heard a loud scream,” they explained, but Yoshishige replied: “Oh, that must had been me! I dreamed that a giant snake came crawling from the pond trying to get me, and so I drew my Kunimune and chased her away.” When they looked at the sword they jumped with fright because it leaned fully drawn at the window aperture. On this incident the Tenkyūwari got its second nickname Yumegiri-Kunimune (夢切り国宗, lit. “Dream Cutter Kunimune”). One of the servants, Kataoka Sanuki (片岡讃岐), told this story his son Shishirō (七郎), and when Shishirō´s younger brother Nasojirō (七十二郎) heard of it, he reported it to the Satake retainer Kurozawa Fuboku Motoshige (黒沢浮木元重), who wrote it down in his book Fuboku Oboegaki (浮木覚書, “Fuboku´s Notes”). *1 The Society for Preservation of Japanese Art Swords (Nippon-Bijutsu-Tōken-Hozon-Kyōkai, short NBTHK, 日本美術刀剣保存協会) issues authentifications on sword blades which are divided into four grades: worthy of preservation (hozon, 保存), especially worthy of preservation (tokubetsu-hozon, 特別保存), important (jūyō, 重要), and very important (tokubetsu-jūyō, 特別重要). *2 He was adopted in 2005 by the then head of the Ii family and bears today the name Ii Tatsuo. *4 “Literary Notes of Ansai.” Ansai (安斎) was the pseudonym of Ise Sadatake (1717-1784), an expert for military-aristocratic etiquette (buke-kojitsu, 武家故実). *5 A work of Kunieda Seiken (国枝清軒) about different military activities and anecdotes of Sengoku-period bushi. It covers the time from the first year Daiei (大永, 1521) the the 14th year of (天正, 1586). *7 His actual name was „Kagetora“ (景虎). *8 Shimabara no ran (島原の乱, 1637-1638). An uprising of local peasants against the high tax burden of the region of Shimabara (Kyūshū).